If you run a cafe or restaurant, having a great looking modern website is a must these days. More and more tech savvy diners are looking online for reviews, prices and photos of food establishments before booking a table so if you have a poor website it can affect your bookings. Luckily you do not have to spend a fortune hiring a web design company to develop you a website from scratch – you can purchase a pre-made HTML Website Template which you can then customize to fit your needs exactly and have a great looking site up and running in no time at all. 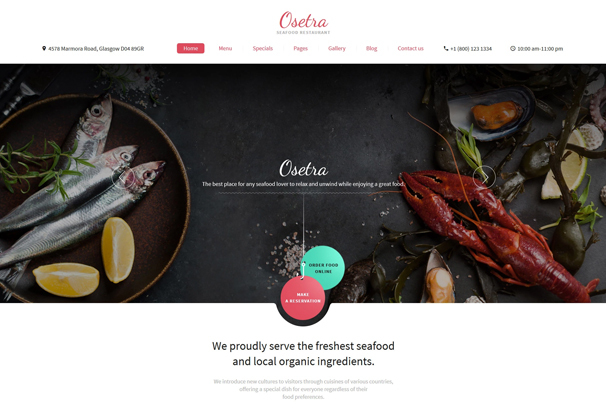 We have put together this collection of the Food related website templates, with over 50 modern examples of responsive designs. A responsive website is very important as this means it will work on all size screens, from mobiles and tablets to different size desktop and laptop screens. 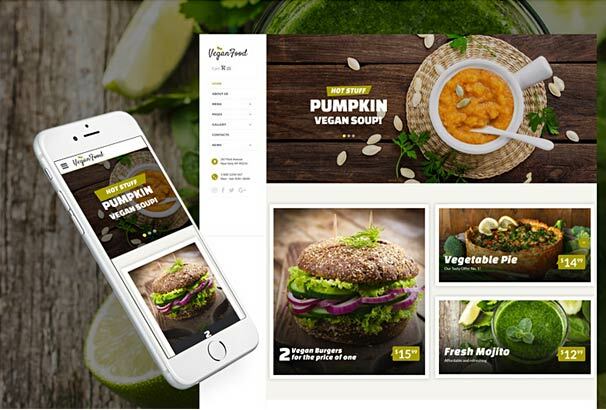 These templates have all been designed specifically for food websites so you can show off images of your food, add menus and opening times, Google maps and address location details and all the other essential information needed by potential customers. Once you have selected your ideal template, you can then use it to integrate with a Content Management System ( CMS ) such as WordPress, Drupal, Joomla and so on. You could even build your site in flat HTML if it doesn’t require updating – this will make it blazing fast to load which will help in the search results, although we would recommend using a CMS as this will help with providing regular updated content – the best way to increase traffic to your site. 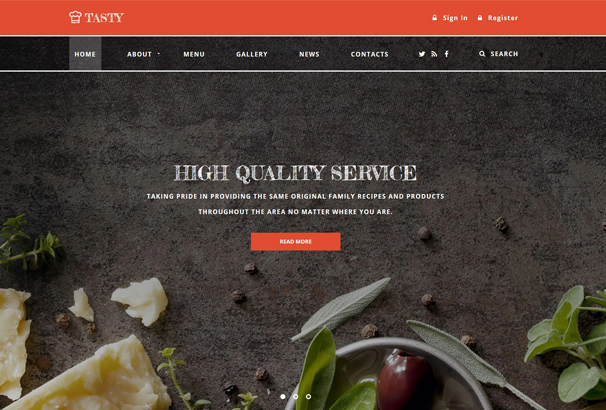 Tasty is such a wonderful template that is designed for your cafe and restaurant websites. It has a Slider, Parallax effect and background video features. These features make the template looks visually impressive. Chalk fonts have been added to the general web page style. Except the above features Google map is also available at the bottom of the page, so that your guests will find your location easily. 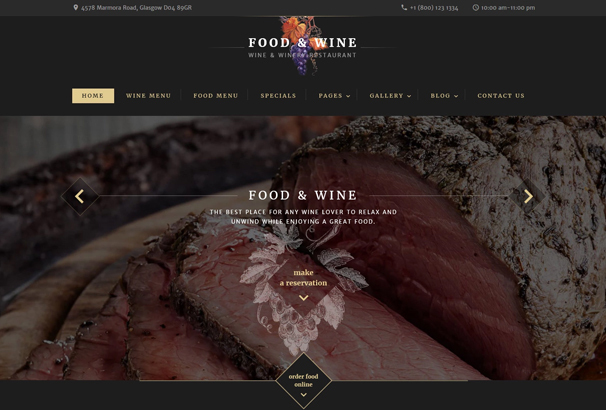 This Food Wine website template is such an amazing template that will definitely take your food business one step ahead from now. It is a great way to show your online presence. 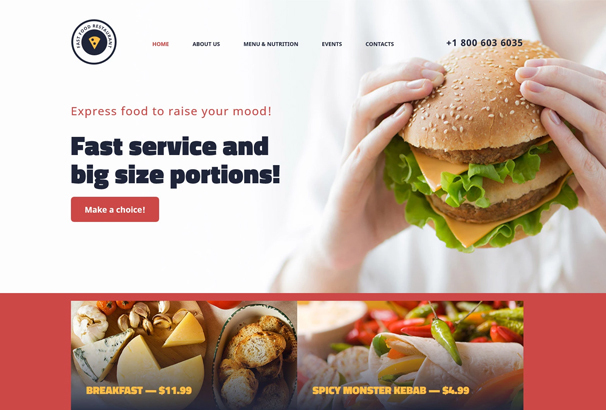 This template is a multipurpose theme and you can use template for any kind of food business you want. However, this template has 35 pre ready extra pages and 13 blog layouts. You can choose anyone you want to. Food Wine template offers different gallery slopes as well. 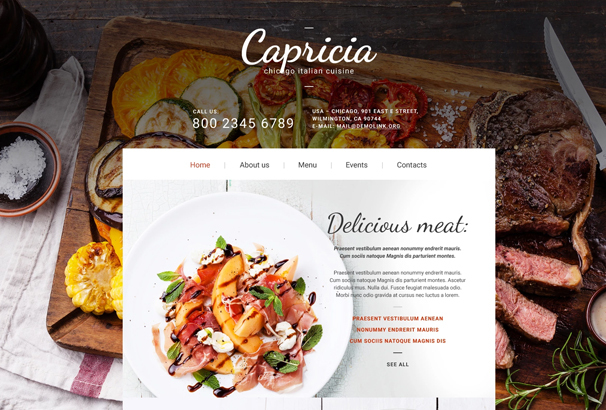 Cafe and Restaurant Website template is create to represent an online restaurant business. It has a well organized layout to place over delicious food images. 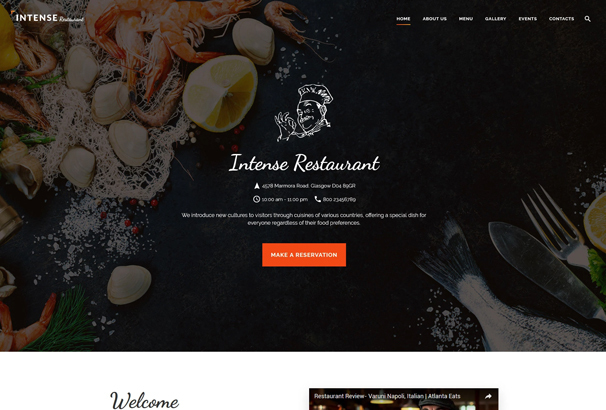 This template have amazing slider on Homepage to create a restaurant atmosphere online. It is quite different than other templates and you can customize it if you want. This theme has an enriched layout with a well balanced structure. The homepage of this theme has enough space for the company story. Besides, a attractive navigation menu, gallery showcase, audio and video support etc are also available. 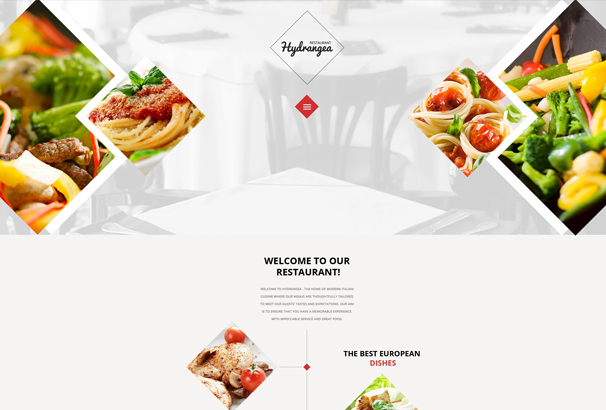 This European Restaurant Web Template will be a great choice for you. However, a Live search feature is also introduced for your visitors. 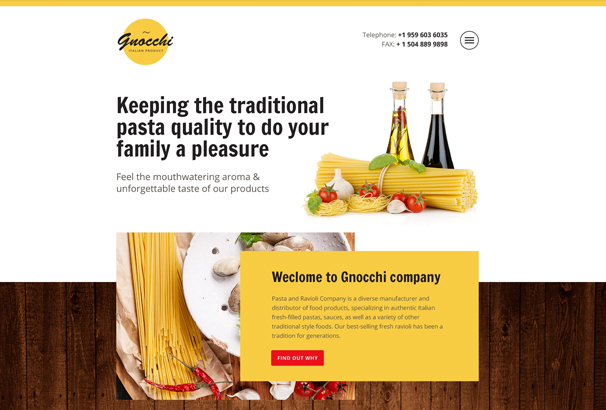 If you need to create an Italian restaurant, this website template will be the best choice for you. This template is cozy and elegant. 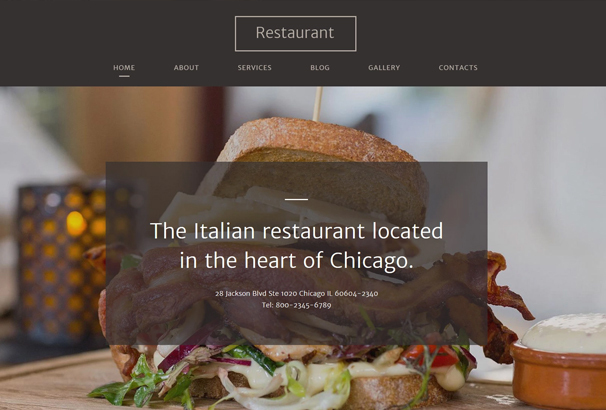 Italian restaurant website template is 100% responsive and it can work smoothly on all devices. However, this template can be used for your business promtion. The neat and clean look, some attractive features will engage more and more visitors to your website. 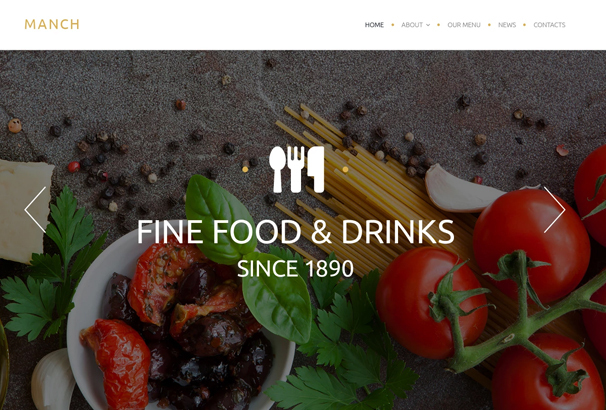 Italian restaurant website template is a fully responsive template for your food business. It has introduced some amazing features that will create a different atmosphere in your website and it will definitely increase your potential customers. However, you can add your menu in your website with some mouth watering pictures. Besides, you can add your business image, contact details, location on the Google map etc. Moreover, An online live chat and contact form has also introduced to reach you all the time. It is an amazing responsive website template designed with Bootstrap. This template will run smoothly on any device. Osetra has come up with some features like blog layouts, gallery views and supplementary pages that will help you manage a unique multipurpose business website. 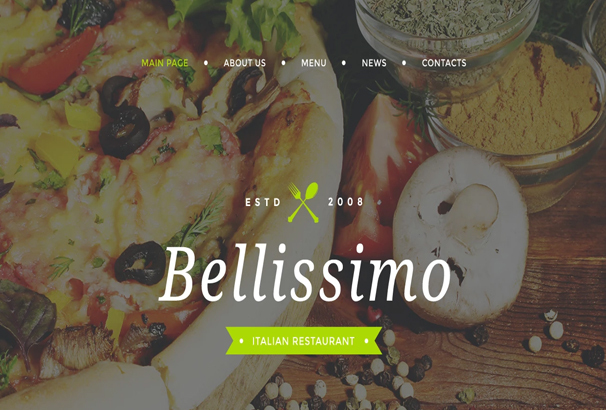 Bellissimo is a Italian restaurant website template which is a visually enriched design. This design is exceptional due to the ribbons which add a subtle touch to the page look. As Bellissimo is a fully responsive template, all the contents will be rendered smoothly on all devices. It is a powerful and stylish Cafe and Restaurant Website Template. Every single element of this design are well organized. Mach template is fully responsive and it looks amazing on any type of device. This template has come up with a number of handy features. Manch is a multipurpose template and can be used for cafe, restaurant, photography, portfolio, personal websites etc. It is A full-width layout and it has refined menus, sliders, galleries, testimonials, services, contact and lots more features. 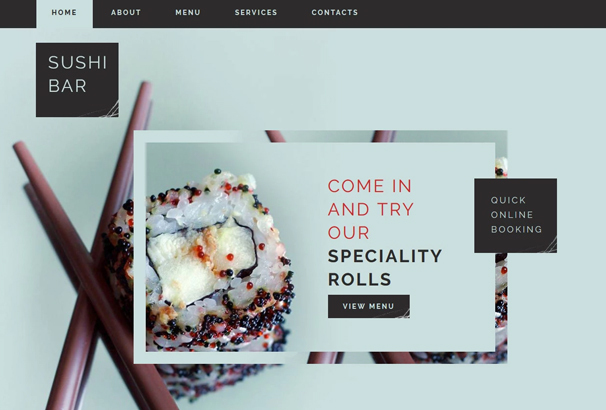 If you want to create a sushi website for your business you should have a look at this template. As the author believes, a great website needs a great design and it is such a template with some amazing features and obviously a great design. Sushi bar template have Unusual layout, pastel colors, overlapping design elements, square-shaped logo, call-to-action buttons etc. We must say, this is a decent template in every way. 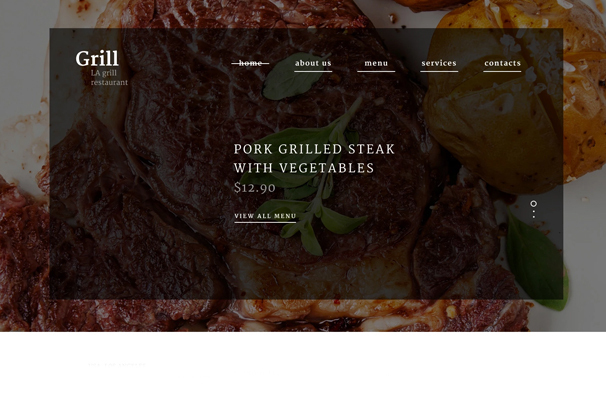 BBQ restaurant website template introduces an impressive dark design. This template will definitely create an elegant atmosphere of a restaurant that organises live music. Besides, It has a testimonial section for sharing positive reviews of the customers. This template has lots of features and it is clean coded. So, why are you waiting for! Try this template now! 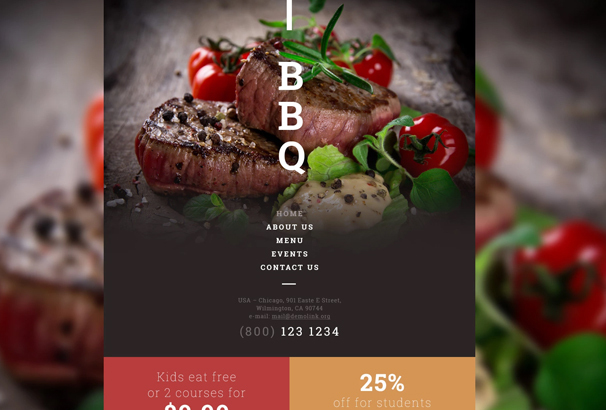 BBQ Restaurant Responsive Website Template is a responsive template. It has introduced a special retro look that will create an unique online business presence. When your user will visit your website they will feel an eye-catching visual homepage that will engage more customers. The main navigation is fixed to the top of the page. Besides, this theme has a Built-in counter that will keep your customers updated on the number of happy clients has been served. 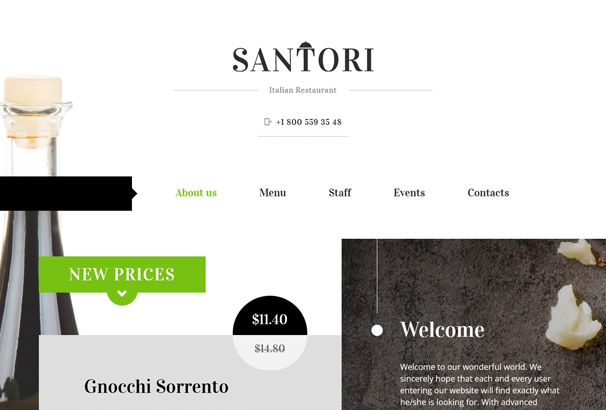 If you are looking for a theme for a Italian restaurant, we would recommend you to check this out. Santori website template has a sticky layout. The menu and prices are highlighted in an organized way. This templates will be the best choice for your business promotion. It has a pre reservation feature on the homepage. Besides, Google map, social media icon, sending quick message features are also included. Moreover, A ghost button has also introduced to make a special charm on this template. Though Lots of people like fast food but it is not too healthy. People prefer fast food due to its quick, tasty, affordability and lots more features. 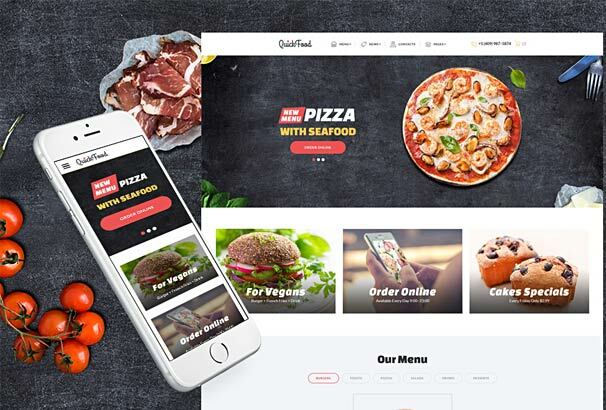 If you use this template, you can represent your fast food business online and showcase your delicious fast foods through your website. This template will help you to impress more customers. However, this template is responsive and have some wonderful features and widgets. Check the live demo of this template! 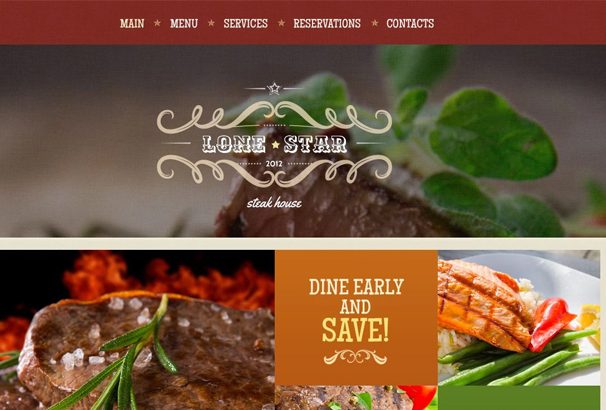 Lone Star is designed for online restaurants and steakhouses. It is designed in Western style. This template has a slide show which can save time people from visiting the restaurant. Besides, it has a Content area, menu and testimonial section that will create an eye catching effect for your website. 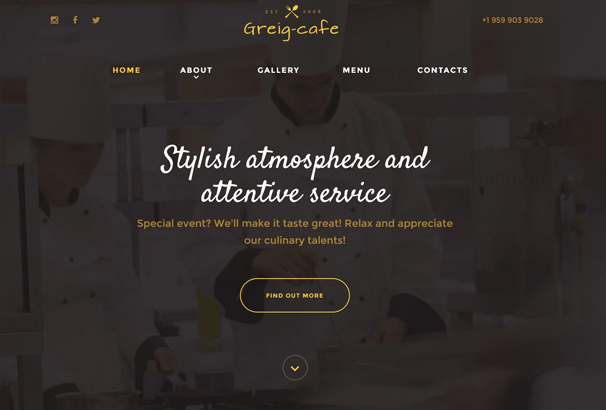 Greig is a responsive cafeteria website template. It is visually rich and it helps to promote your dishes with mouth-watering effects. This template has a full-screen header. Besides, it has a parallax slider, google map, gallery to showcase you dishes and lots more features to attract the audience. 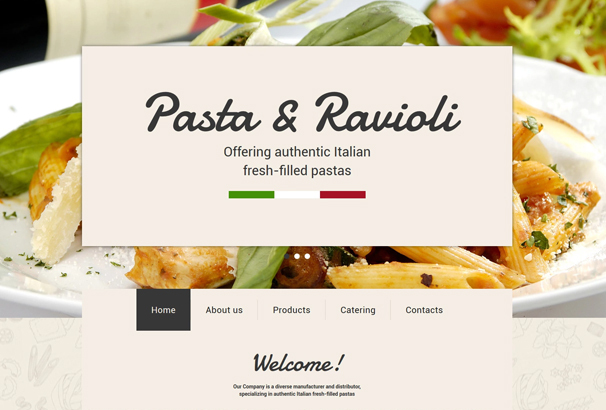 Pasta and Ravioli Website template looks really warm and delicious. This template will definitely gives you a feel of italian food website. In this template the main menu will be hidden that save space. Besides, products are categories in an organized manner. This template will be called as a good choice on the topic. If you use this template it will be the best advertising to attract more customers. If you are thinking to use this template we would recommend you, don’t think! Just go for it. This template will definitely make your website more attractive and appealing. This template will help you to tell the story of your company. It is fully responsive and compatible to any of your devices. 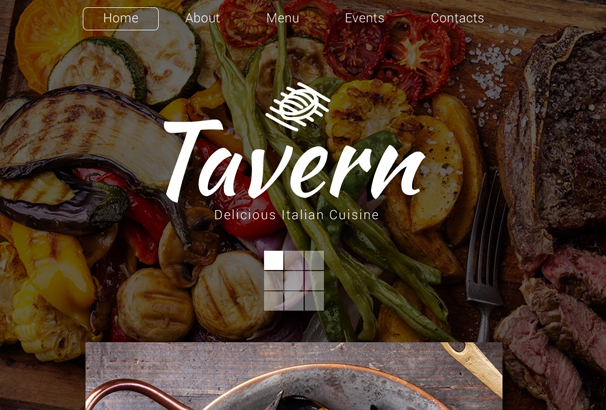 This is a fully responsive Restaurant Website template. It is designed based on the rhombic shapes, a minimalist menu, and a bleached image background. According to the author this template will help to to tell the story of your restaurant. 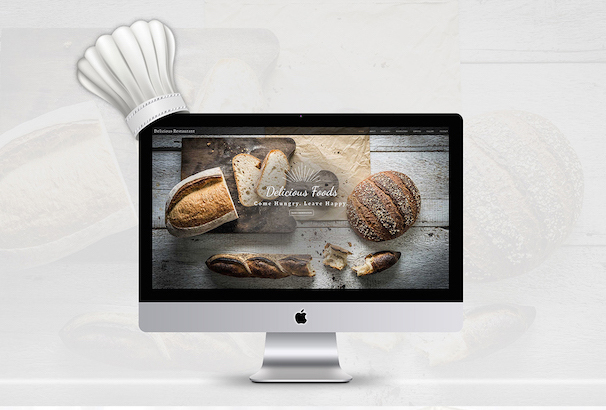 You can use this responsive template for any kind of food related business websites. This template is the best solution for cafe and restaurant websites. It has a full screen appetizing image to attract customers. This template has includes the Testimonials in a slider. So you can include reviews as many as you want to add. 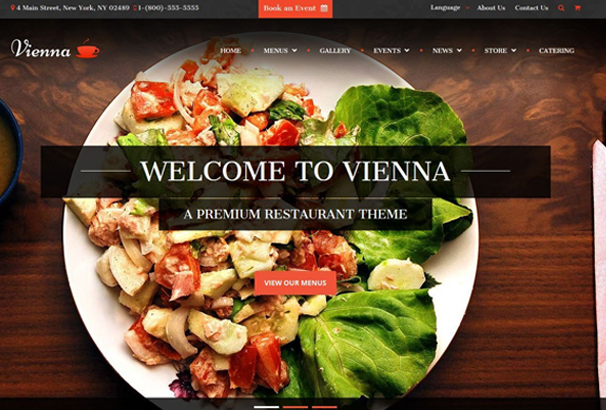 Cafe and Restaurant Website template is create to represent an online restaurant business. It has a well organized layout to place over delicious food images. This template have amazing slider on Homepage to create a restaurant atmosphere online. It is quite different than other templates and you can customize it if you want. You should have a try now! 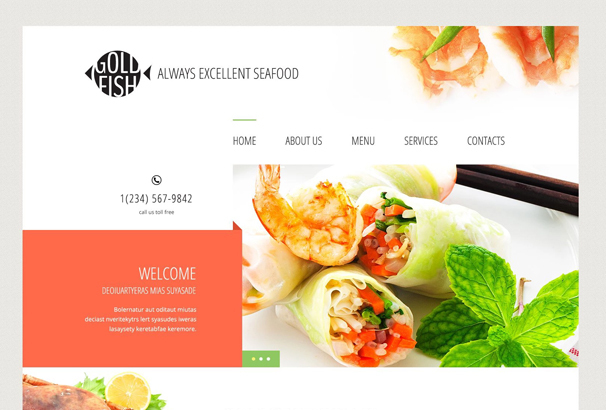 If you are looking for a responsive template for your sea food restaurant, you should have a look at this Gold Fish responsive template. It features numerous illustrations for your website that will definitely match your sea food business. Besides, it has a well balanced structure and it provides some amazing widgets to welcome your customer, contact details, google map and lots more. 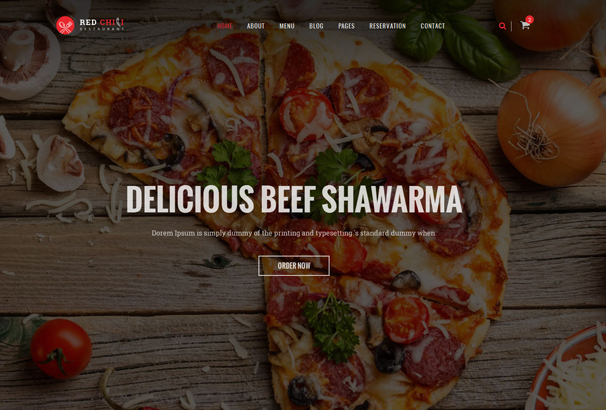 This is a responsive website template for your restaurant or food business. 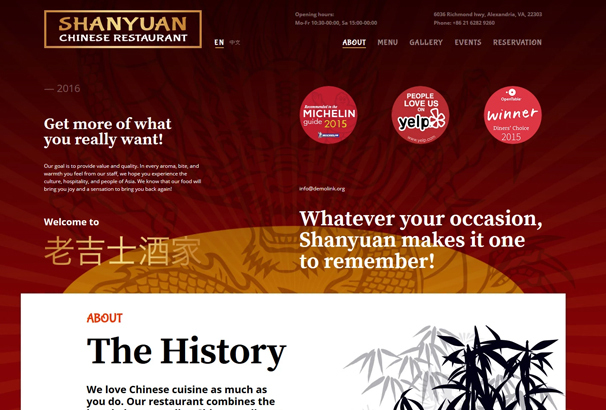 This template is designed to promote your chinese resturant business. Chinese restaurant website template features some pre ready pages and UI that will make your website unique. 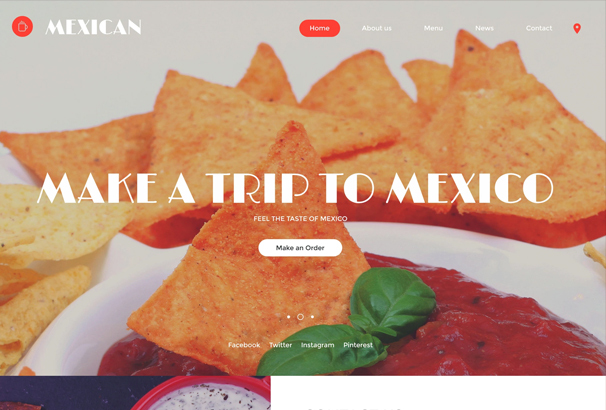 Mexican Website template is a professional website template for restaurant. It has a flat layout that creates clear look of your website and it has a well organized content. This template looks stylish and classic. It has some amazing features. You should definitely have a look at the demo of this template. 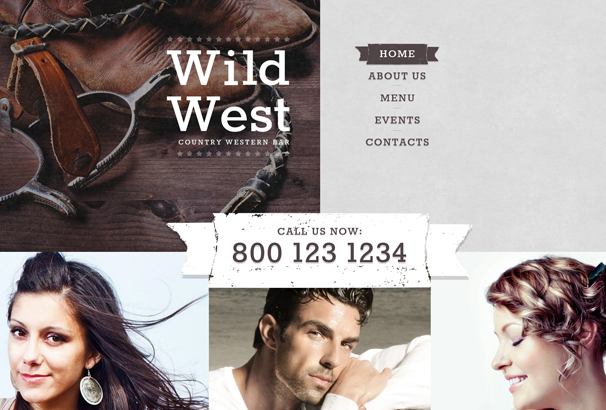 Country Western Bar website template is a fully responsive template with an elegant design. It features retina-ready images, sliders, and Google Maps and lots more. It has a well-structured layout and it provides an amazing user friendliness. 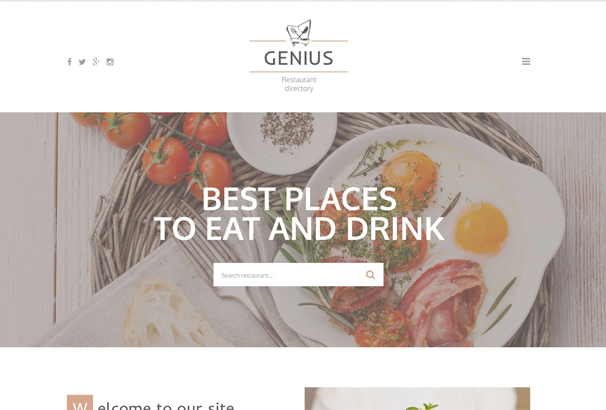 Establish your business online with this amazing template.Genius website template is designed based on your cafe and restaurant.It is a clean an fresh template with some latest features that will create a branding image for your business. 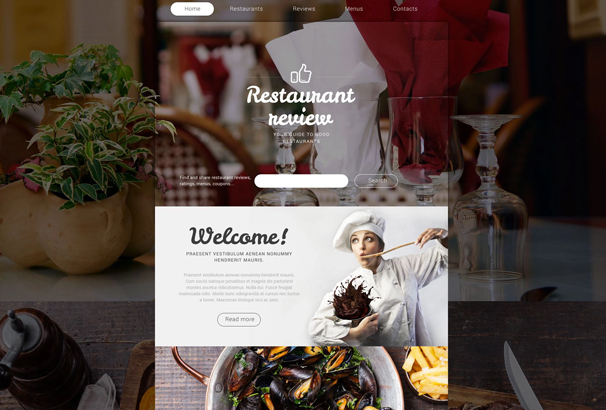 Restaurant reviews website template is a well-built design with some amazing functionality. If you are thinking to choose a template that will engage your audience and have a user friendly layout, you should go for it. This template has retina-ready images, large photo backgrounds, cool Parallax effect, and lots more features that will welcome more people in your website and increase your online business. This is a responsive bar website template. It helps to represent the company through the website. 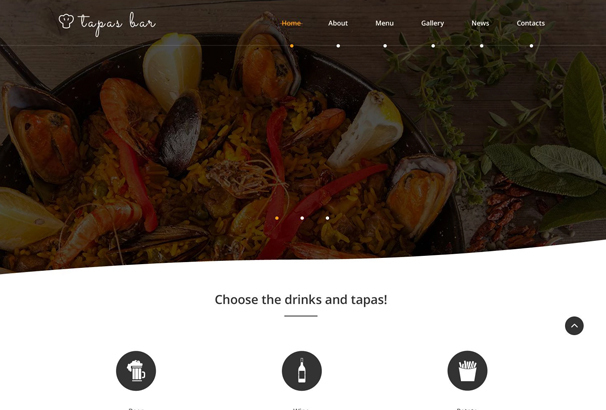 Tapas has an attractive home page with all the information about the bar, menu, events, and customers’ feedback etc. 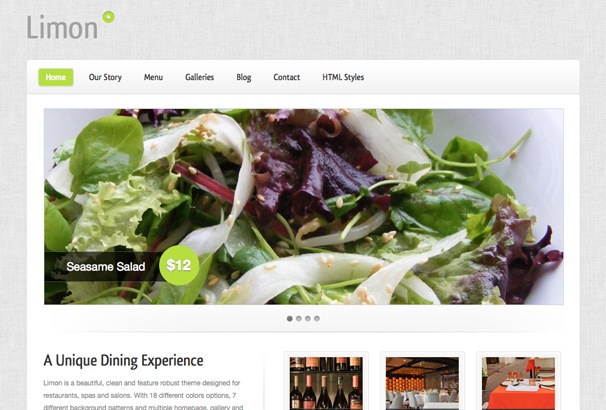 This template was primarily designed for cafe restaurant and food drink websites. But this theme can be customized to create any website regarding food niche. 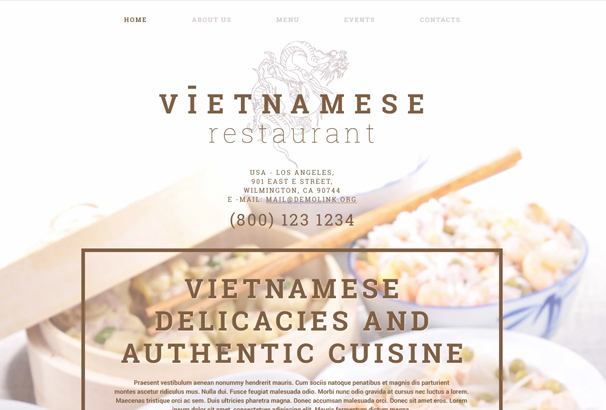 Vietnamese is a responsive template and has a lot of amazing features that will provide an amazing visualization of your website to your potential customer. 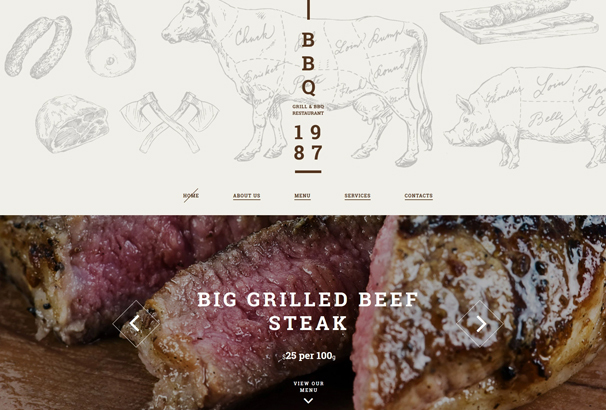 BBQ Restaurant Website Template is an elegant design for cafe and restaurant website. You can impress your potential diners with the website visuals. It is a fully responsive theme with a custom mobile menu. Besides, this theme has a google map and easy to reach contact form which will help your customers to reach you in a convienient way. 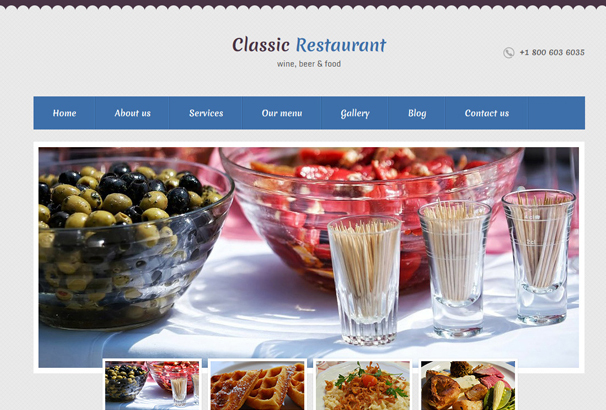 It is a classic, clean and easy to customize template created for restaurants and bar website. This is a clean, flat, and mordern and modern multi page website template. This theme is unique, & flexible. You can use this template for bakeries, ice cream shops, restaurants, or any other niche related to food industry. 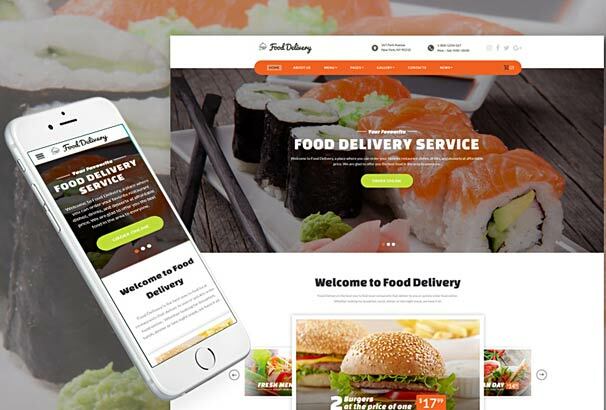 It is a HTML Template and it is suitable suitable for food ordering & delivery system. Also you can use this theme for restaurant and cafe as well. 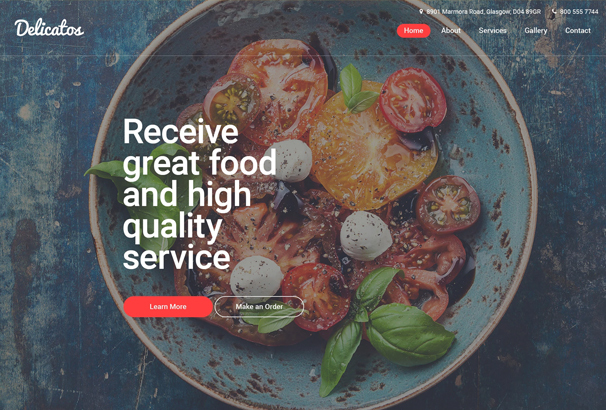 It is a clean and modern HTML Template for Restaurant, Hotel & Fast Food shop. 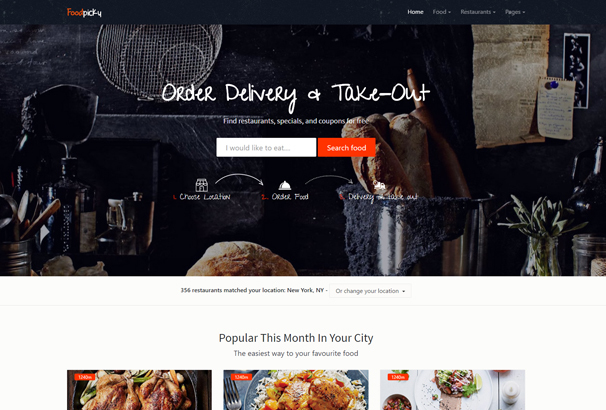 This theme is perfect for any kind Restaurant, Catering Service, Fast Food, Pizza, Food Court, personal Chef web sites. etc. It is a premium restaurant template. This template can be used for restaurant or hospitality industry. Vienna is created for restaurant and bar owners, banquet halls, catering companies, hospitality venues and other persons who are working on food niche. 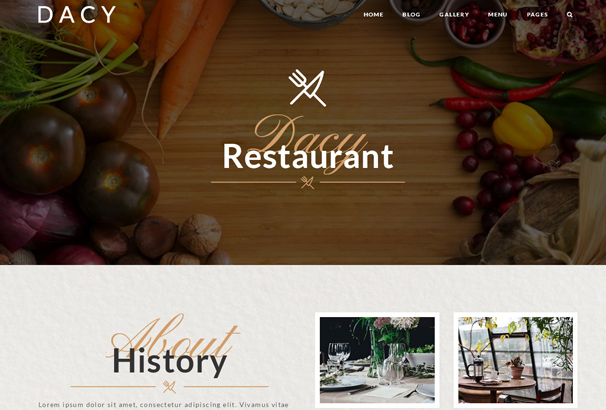 If you are looking for a Responsive HTML5 Template for cafe or restaurant, you should go for Dacy. Dacy is a clean and elegant and easily customizable template. 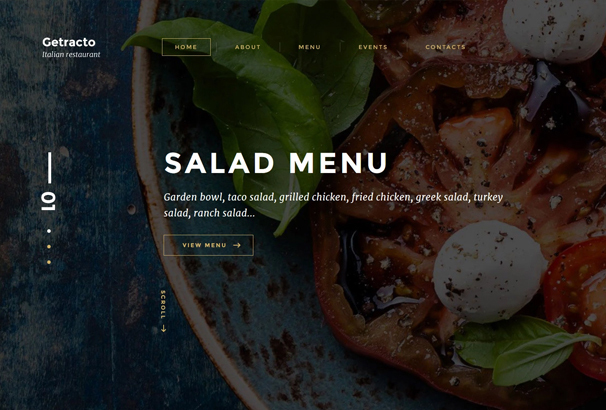 It is a clean, and beautiful HTML restaurant template. This theme can also be used for spa and yoga studio. This theme has 18 different color features, different background patterns and multiple homepage, gallery and menu/services layouts and lots more features.